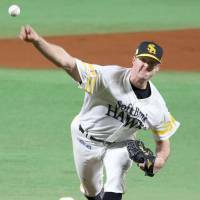 Fukuoka - Fukuoka Softbank Hawks pitcher Rick van den Hurk and Tokyo Yakult Swallows third baseman Shingo Kawabata had a consistent rhythm going in the top of the first inning in Game 2 of the Japan Series on Sunday night. Van den Hurk would throw a pitch, and Kawabata would foul it off, again, and again, and again. Kawabata fouled off six straight pitches at one point until, with the 13th pitch of the at-bat, Kawabata hit a grounder, and Van den Hurk won the battle. Just like he’s won every thing else in his first season in Japan. 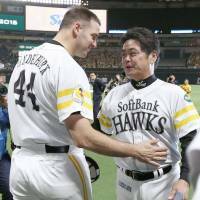 “I was just focused on one pitch, executing one pitch at a time,” van den Hurk said of his long duel with Kawabata. Sunday’s game was just the latest chapter in a memorable first season in Japan for the Dutch right-hander. He struck out seven and didn’t walk a batter over eight shutout innings to earn the win in his Japan Series debut. Van den Hurk has been pretty good all year. He began the year on the farm team, but instead of moping he spent that time honing his skills on the mound. Van den Hurk made his ichi-gun debut June 14. He’s won every decision he’s gotten since then. Van den Hurk was 9-0 during the regular season and has now won a pair of postseason games. In his Japan Series debut, he used he made liberal use of his curveball to keep the Swallows off-balance and only allowed three hits. The pitcher said he knew early on that it was going to be a good night. The good vibrations also helped him flummox Yakult slugger Wladimir Baletien. “He just pitched a great game today, nothing we can do about it,” Balentien said. Van den Hurk pitched for the Netherlands during the 2009 World Baseball Classic, while Balentien was on the Dutch roster in 2013. Van den Hurk said he’s faced Balentien before (but not in Japan), but didn’t take any special feelings into the matchup. He struck out Balentien twice and got him to fly out in his final at-bat. 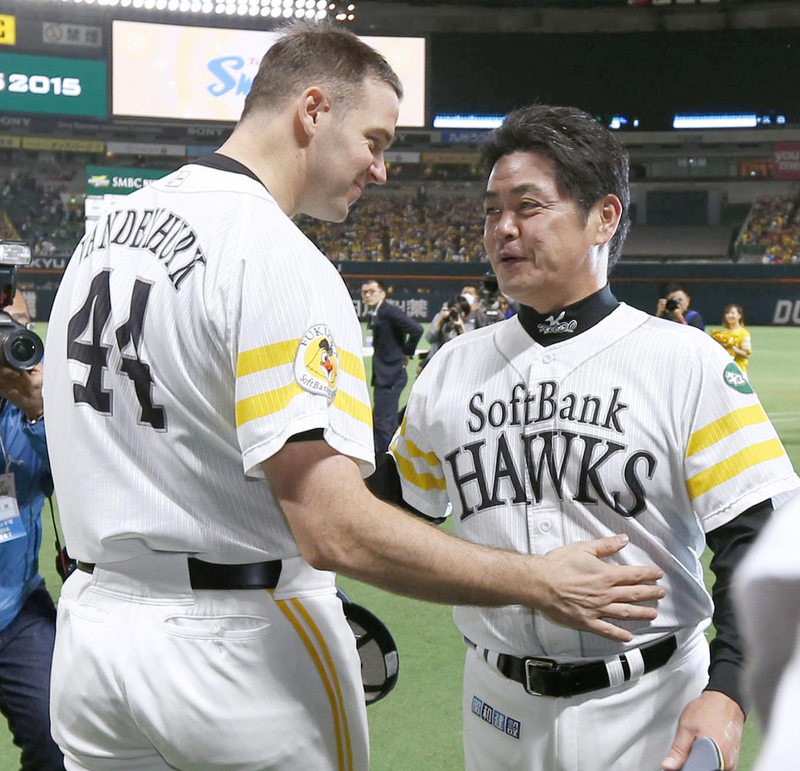 Van den Hurk shifted much of the praise for Sunday’s performance to catcher Hiroaki Takaya. He said the pair worked well together and had a good rhythm throughout the game. 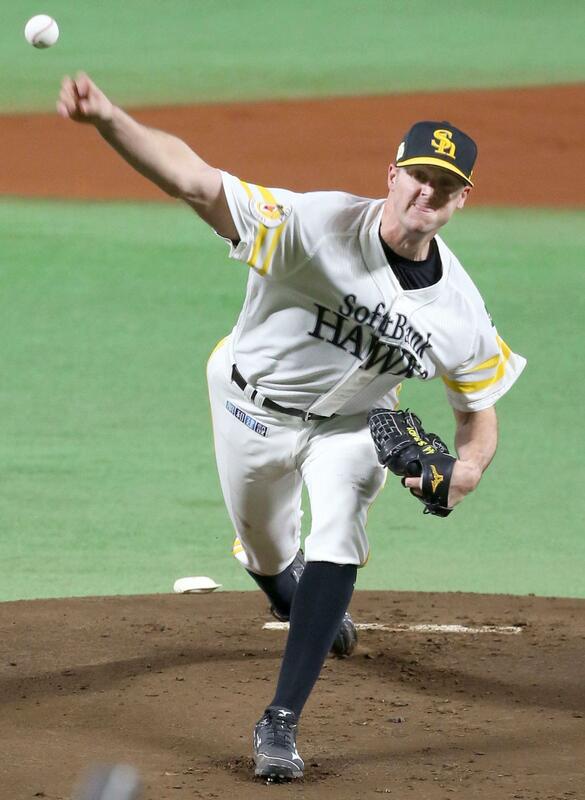 The Hawks have outshone the Swallows both on the mound and in the batter’s box over the first two games. If they keep playing like this, the team won’t need van den Hurk to make another appearance. If Sunday was indeed his last start of the year, it was almost a perfect ending to a year in which he didn’t taste defeat and was able to come through when his team needed him. “I’ve said many times, the credit goes to our team,” he said. “My teammates, the coaching staff, the trainers who keep us healthy, the translators; the whole organization. Shohei Ohtani's drives into the seats at Angel Stadium came with an audience Friday, when the Los Angeles Angels' two-way standout took another step toward his return from Tommy John surgery.